The booking deadline will be listed on the couple's wedding website. You'll get the most options and best rates if you book early. The bride and groom have a lot of details to plan, so it is best to be considerate of their time and book at least 6 months prior to the wedding date. This gives them the time and numbers they need to make and finalize their wedding day plans and budget. As long as the hotel has rooms available, we can book. The deposit gets paid when you make your reservation. Final payments are due 45-70 days prior to travel. How Should I Book My Trip? Most couples have a wedding website with information on how to book your trip. Their website will either have room rates listed, or a quote form for you to fill out and send to us. The couple often receives amenities for their wedding based on how many rooms are booked. They are looking to us to organize all the rooms and keep count. The right thing to do is work directly with us to ensure smooth planning and organization for the couple. Also, make sure you book your trip on time. The bride and groom have a wedding to plan and cannot get an accurate guest count until everyone is booked. We all love good deals, but you want to avoid last-minute problems. Unfortunately, for destination weddings, last-minute guests just add last-minute work for the couple, causing them to scramble to get extra décor, extra seats and extra dinners. How much is the trip going to cost? Check the wedding website. Often times, room rates are posted there. If not, just submit a quote request. Be sure to include all of the details. To do an accurate quote, we need to know how many people are sharing your room, how many nights you are staying, and where you are flying from if air is to be included. For guests, a destination wedding can cost anywhere from $1,000 to $1,500 depending on the destination, departure city and length of stay. This cost covers flights, resort fees, accommodations and food and drinks for typically 3 nights/4 days. We understand, and so do the bride and groom. Not everyone will be able to attend the wedding, and that's ok. Please just let the couple know. What's not included with my all-inclusive trip? You'll want to bring a bundle of 1's and 5's with for tipping around the resort. Gratuities are technically included with your travel package, but based on our travel experience, you'll want to tip something to the bartenders and waiters taking care of you. Be prepared by bringing small bills with so you have them if you choose to tip. The shuttle driver is not a hotel employee and will expect a tip, as will the airport employees. Tours, excursions and spa treatments are not included. You can pay with cash or credit card for these at the hotel. Again, US cash for tips is fine. Insurance is not included, but it is optional when booking your trip. All liquor is included unless you order a full bottle of a specific liquor. This will cost extra. Some destinations, like Dominican Republic and Costa Rica, require a small country tax to be paid locally. This is not included, but we will be sure to let you know about it. What if I find a cheaper price online? We work hard on getting you the best price. If you see a less expensive price for the exact package - dates, airline, airline times, taxes, insurance, transfers, etc. - give us the opportunity to see if we can get the same price. This way we can book your reservation and you can still be counted as part of the wedding party. Usually online prices are lacking something, like transfers or taxes. Please give us the opportunity to help you with this. Please let us know which website you are looking at, and send us a screenshot of the flights, hotel room, and dates so we can recreate it. Since it will be warm, dress cool. For men, khaki slacks, linen shirts, and nice sandals are all appropriate. You will see very few suits and even fewer ties. Ladies, find a nice sundress or capris with sandals. 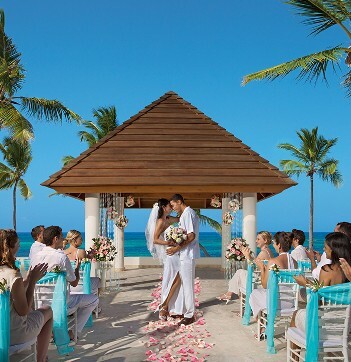 Unless otherwise noted by the bride and groom, destination weddings are more casual than traditional weddings, but if you're unsure, ask the bride or groom. Sometimes couples have planned special dress codes, such as “all white,” so the last thing you want to do is arrive at the hotel with the wrong outfit. If you're attending a destination wedding, you don't have to bring a wedding gift. Some couples tell the guests that their presence is gift enough but a card is still a nice touch in these cases. Check with us about adding a tour or a room upgrade as a gift from you. This can often easily be done. If you still want to give the couple a monetary or boxed gift, give it to them before the wedding or after you come back. One key etiquette tip for guests at destination weddings is to avoid involving the bride and groom over travel or room issues. If your name is spelled wrong on your documents or you missed your flight, call us. Likewise, if your room isn’t ready or the view isn’t perfect, don’t complain to the couple or other guests. This just creates a frenzy. There is no need to add extra stress to the couple. If you have a problem, call or email us. Our travel partners have 24/7 help desks. Their phone number is listed on your travel documents. Not everything goes as planned, just be flexible and polite. Have more questions? Call us at 507-267-4857 or email us!